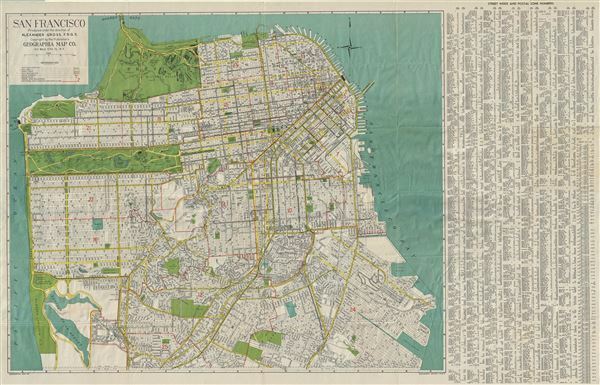 This is a fine 1950s map or plan of the city of San Francisco, California, issued by Alexander Gross. The map covers the city from the Golden Gate Bridge south as far as city limits and the 'Laguna de la Merced. It notes all major streets, playgrounds, house numbers, piers, parks, transit lines and postal zones, along with a host of other topographical features. A street index with postal zone numbers is included on the right of the map proper. The map comes with the original cover which includes a list of places of interest in San Francisco. This map was produced under the direction of Alexander Gross F.R.G.S., and published by the Geographia Map Company, NY. Very good. Minor wear along original fold lines. Blank on verso. Comes with original cover.